May 5, 2008 – she eats. If I thought that my husband was repulsed by the giant lump of pasty saltpork that was sitting idly on the counter yesterday, just minding its own little salty business, it was nothing compared to his nearly-hysterical reaction to the sight of the frog legs marinating on the counter behind him. As I watched him, utterly bemused by the sudden tumult caused by my pile of frog legs, it occurred to me then — between his frantic pacing around the kitchen and beleaguered cries of “You can’t be serious!” and “They look like peoples’ legs!! !” — that there are two types of people in this world: people who were brought up on Houston cuisine and people who weren’t. All the magical, nostalgic dishes of my youth, which I have only realized as an adult are the product of a childhood spent in southeast Texas, in Houston. 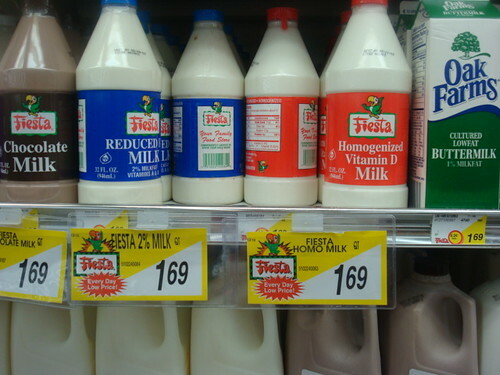 A product of growing up in a complex confluence of cultures: southern, Cajun, Mexican, all flowing together as one. All mingling and bubbling and stewing to create the unique cuisine of Houston. Someone mentioned in the comments section recently that Houston doesn’t have an “indigenous” culture of its own, nor does it have any specific ingredients that can be pegged as “Houstonian.” I agree, heartily. Because what we have — what we’ve cobbled together — is greater than any one cuisine. We’ve taken the best of all the many people and many cultures that have settled here and made it our own. So, on Sunday, I unassumingly set about making a dinner that — to me — was normal. But what it represented, now that I look back on it, was everything that I love about Houston: the fresh ingredients, the unapologetic mixing of cultures and the idea that you should eat what you love, no matter who or where it comes from. 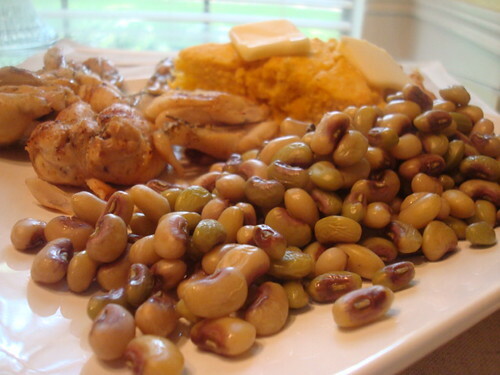 The cornbread and peas could, in reality, be eaten as a meal by themselves. The creamy, fluffy cornbread is the perfect counterpart to the rich meatiness of the purple hull peas. 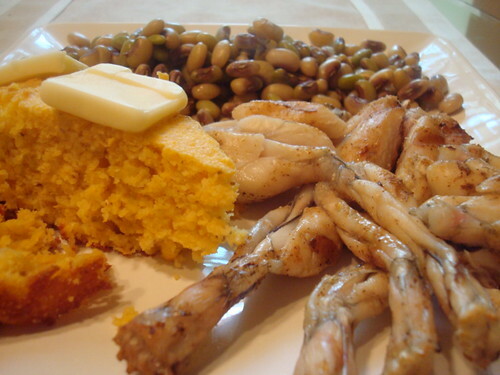 However, if you’re going to add an actual meat to this meal, something light and delicate like frog legs (or shrimp, or catfish) is ideal. The cornbread recipe that follows is one I adapted from none other than Alton Brown, whch is essentially the exact same recipe that he adapted from generations of old southern ladies. The cornbread which results remains unchanged from the dreamy, golden manna that my mother and grandmother have always made. You’ll want to use buttermilk. Homo milk has an altogther different taste. Preheat oven to 425 degrees F. Place a well-seasoned (read: good and juicy) cast-iron skillet into the oven while it preheats. In one bowl, combine the cornmeal, salt, sugar, baking powder, and baking soda and whisk to combine. In a another bowl, combine the buttermilk (I cannot stress enough how important it is to use buttermilk), eggs, and creamed corn and stir until combined. Slowly add the dry ingredients (I do three separate additions, stirring well in between) to the liquid ingredients and stir to combine. Remove the cast-iron skillet from the oven. Carefully add vegetable oil to the cast iron skillet and then pour the batter into the skillet. Bake until the cornbread is golden brown and springs back upon the touch, about 25 minutes. 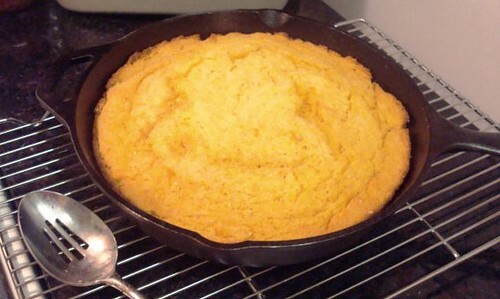 Because your skillet is well-seasoned, the cornbread will slip right out and onto your plate. If you happen to see purple hull peas in your local store or farmers market, BUY THEM. If you live in the city, this might be your only chance this year to get any. You don’t know how lucky you are to have found some! They aren’t black-eyed peas. Don’t buy black-eyed peas and think that they’re the same thing. They aren’t. If the peas aren’t already shelled, shell them. Wash them well. Put in a pot with water that more than covers the peas. Simmer on low and skim off any scum that rises to the top. If your peas are well-washed, this shouldn’t happen anyway. Once your peas are scum-free, add a chunk of salt pork and a few good pinches of kosher salt. 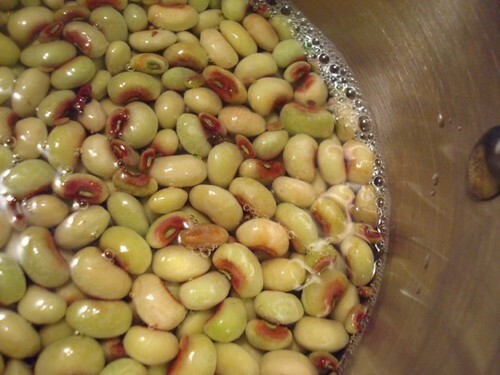 Bring the peas to a rolling boil and then reduce to medium. With the lid on the pot, let the peas and salt pork cook for 15 to 20 minutes, or until done. Remove salt pork before serving and take time to enjoy the lovely purple shade that it’s turned. 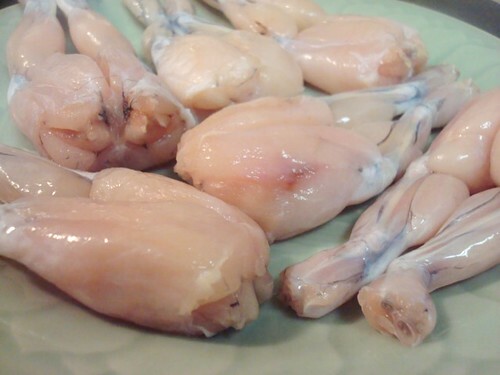 Buy some fresh (not frozen) frog legs from your local butcher. Remove them from their packaging and pat dry. Season on both sides with a little seasoning salt (I prefer Lawry’s) and allow to sit for a while, but not too long (about fifteen minutes should do it). 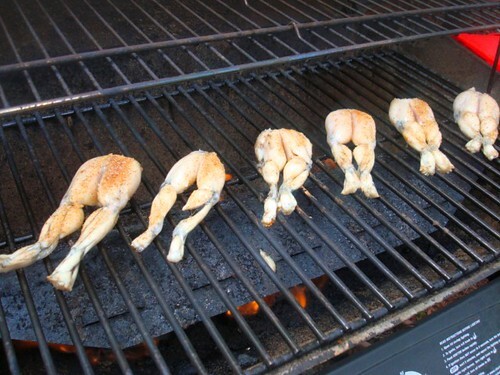 Take your froggies out to the grill and grill them over medium heat, about two to three minutes per side. You don’t want the meat overdone, since it will lose that delicious juicyness if you cook them for too long, so watch them carefully. When the meat starts to turn opaque white with just a hint of browning, they’re done. You’re ready to serve dinner now! If you have a bunch of people, you can make this an even bigger and better meal with the addition of some greens (collard or mustard, your call) and some squash boiled down with butter and sugar and a little bit of salt. For dessert, if you haven’t eaten all the cornbread, split a piece in half and drizzle a bunch of honey over it. Enjoy your Houston meal, and toast the fact that while we may not have any cuisine of our very own, we’ll happily appropriate someone else’s, incorporate it into our crazy, mixed-up culinary family and love it every bit as much as they did. P.S. My husband gamely ate the frog legs, even though he claimed to feel like a contestant on Fear Factor. He admits, however, that the meat is delicious…if you can just get past the visual above. P.P.S. Upon seeing the pictures from our dinner last night, my boss remarked, “Your poor husband. Did he know what he was getting himself into with you? It’s like Beauty and the Geek.” …with the clear insinuation that I was the Geek in that little equation. Posted on May 5, 2008 May 5, 2008 Categories comida autentica, houston / texas, linksLeave a comment on Happy Cinco de Mayo!